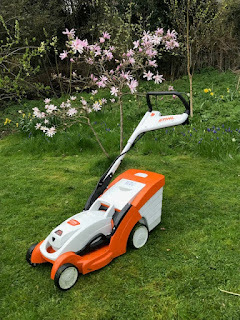 Some weeks ago I wrote a product review for the Stihl Cordless Grass Trimmer. I said at the time that I had a couple of Stihl products to trial and now is the time to write up about the other product. The Compact Cordless Chainsaw MSA 120C. This chainsaw is designed for the domestic market, it is fairly small and remarkably light but not less a chainsaw. This means that you need proper chainsaw safety-wear if you are going to use it. Wearing proper chainsaw gloves and trousers and proper work boots is essential. Also wearing a hard-hat with a peak and visor matters though you do not need ear defenders apparently because it does not make the level of noise that a larger more professional chainsaw does. I thought I would feel a bit of a nana dressed like this to be in my own garden but once kitted up I mainly felt safe. I am a total chainsaw novice and I am very aware of how much respect I need to show this piece of equipment. I had been talked through how to use it by the lovely lady at Farol Ltd, my local Stihl dealer. It might not be professional grade, but it could still do me a large amount of damage if I make a mistake so I was very grateful for the care that was taken to make sure I was properly kitted out and that I understood how to use the machine. The first time I tried it out I worked at ground level, in which I mean I did not use any ladders. I wanted to be used to the feel of the machine and how it worked before taking any steps upwards. The lilac in the front garden was the first victim/choice. It does not have very thick stems, about an inch or so in diameter and chainsaw made short work of it. In the past I have pruned this fairly easily with a pruning saw but as I said, this was an exercise in getting to know the machine. A few weeks later and autumn has arrived, the perfect time for tree pruning. I suited up again and strode out in the garden. I was already very pleased with the chainsaw as I had fully charged up the batteries when I had last used it, which was about eight weeks ago, and the batteries were still pretty much fully charged. This was very good. First test for the day were these overhanging branches near the top of the driveway. Ok, you might not see much difference but I do. A few significant branches have been removed and it has let in a bit more light. On to the next task - the field maple. This is a magnificent tree that forms part of the side boundary. It is wonderful this time of year as the leaves turn the most amazing butter yellow before falling to form a thick carpet of leaves. It also overshadows the quince tree and has created quite a shady part of the garden. I have pruned it in the past but it has got beyond what my little pruning saw could handle. Whoomp, and some large branches are removed. This was remarkably easy to do and I was seriously impressed with the little chainsaw. I was also impressed that I managed to do this with no injury to myself. There is some guidance given in the very good instruction manual (please read the manual) and I did spent a bit of time checking where I was and where the branches were before cutting. These branches were a good three or four inches in diameter and the saw went through them like butter. This also made the clearing up afterwards quite easy too as I could saw up the branches to movable pieces easily. Some I have left in situ to form hiding places for wildlife. This is not the best picture, but the really big branch that used to overhand the quince tree has now gone. I am hoping that this makes a big difference to the quince now it will get more light. I was probably out there for a couple of hours cutting and pruning various trees and shrubs. This little chainsaw made light work of it all and was huge fun to use. I had to tighten the chain towards the end of the session, this was easy to do and I was very glad that the chainsaw has the safety feature that you can make the battery pop out of its connection, meaning there is no danger of you accidentally switching on the machine when you do not want to. After use I gave it a good clean. It is worthwhile looking after the chainsaw properly. The battery has an indicator so you can see how much power is left and I still had two of the four bars lit when I had finished for the day. I thought this was very good. Whilst I had been out there for a couple of hours that does not mean the chainsaw was in use all that time. Each branch takes less than a minute so it was not in constant use. Also, because I have this and the grass strimmer that means I have two batteries as they are interchangeable. So even if I had run out of power I had a second battery ready to pop in. I do like having two batteries. The chainsaw does not mean that I will never need the services of a tree surgeon as they are the experts and the ones who need to do the difficult and skilled work. 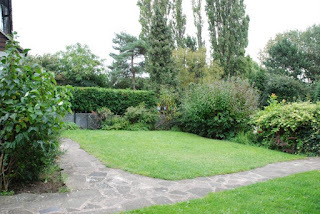 But I can now lop off the odd branch with much more ease and that makes my life and the garden's just a bit easier. I can absolutely recommend it. I have the same saw, I have pruned my apple, pear and other assorted trees this year with it. it's an excellent domestic saw with none of the hassle of petrol saws especially when you're in the tree working with it. Try the hedge trimmer in the range, it's even more impressive. This is good to see! I think there's a tendancy for people to think of chainsaws as being for lumberjacks who cut down huge trees, but as you've perfectly demonstrated they can really take the pain out of general pruning work, which is great news for keen gardeners. Thanks - It is perfect for small/medium sized jobs but it will never take away my need for a proper tree surgeon when I need skilled work doing. Thanks for sharing. It's easy to use or not. My husband's arm is not strong, can he use? Hi I really cannot judge this, it would be best if your husband went along to a Stihl dealer and tried one out. As long as you're safe, I think a chainsaw is a great way to quickly get your garden under control, especially if it's well overgrown. Thanks for sharing, I know what I'm going to be doing this weekend!